Vinyl Soffit gives your home the look of freshly painted wood in often overlooked or key accent areas, like under the eaves of your roof. It also adds value and protection to your home by helping to prevent the damaging heat and moisture from building up in the attic. The unique look of Vertical Siding shies away from the traditional, and helps you create a home that is uniquely your own. Vertical Siding is an ideal choice to draw attention to specific areas of your home’s exterior such as a doorway, gable end or a wall span with strong vertical lines. 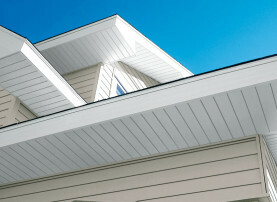 *Center, fully vented and Double 5” Select panels should be used for soffit applications only. They can not be used for vertical applications.